Time to get back to updating my poor, neglected blog! Although I have not had as much time as I would like to knit, I have finished a bunch of projects that I haven't shared. I will try to post them over the next couple of weeks. Let's start back in August 2011. 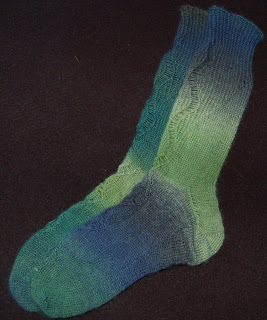 I finished a test knit for Yarnissima's "Scaletta" socks. I loved the pattern, but really did not like working with the yarn I chose. It was single ply with varying thickness and even broke once while knitting. I was really worried that the yarn would not hold up as a sock but luckily it made it through it's first season just fine. Additional Comments: made second sock mirror image of the first.